So, what is it about snakes that is such a big no-no for so many people? Aside from the fact that snakes are elegant, beautiful creatures (how many animals do you know that display such a gorgeous range of striking colours?) they are also usually very calm and gentle creatures. Even in the wild, 9 times out of 10 the most dangerous snakes in the world would rather avoid conflict than attack you! It’s obvious that snakes have a pretty bad reputation in the animal kingdom, so it’s no wonder that so many people have such terrible phobias of them! 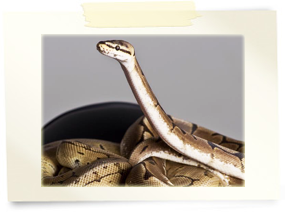 But here at Oreo and Friends, our snake family would love to help anyone that’s interested in overcoming their fear. For many people, facing their phobia head on and working up the courage to hold or even just touch a snake for the first time can help them to understand that there’s really nothing to be afraid of! We can assure you, snakes aren’t all the monsters they’re made out to be! Touching or handling a snake can be quite disconcerting for some people at first – perhaps it’s the slithering, or the way the scales feel against the skin! 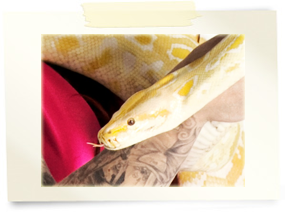 But once people let go of their misconceptions, we generally find that meeting our snakes becomes a very pleasant and fascinating experience for our guests. It’s important to remember that our snakes are friendly and sociable animals, and all they want is to feel safe with you – just like any other animal would! So, perhaps you’re already a snake lover, or perhaps you still need some convincing! Either way, our slithery wonders can’t wait to meet you!